Four companies in the upper echelon of 2018’s Fortune 500 are rapidly growing their footprint in Los Angeles. 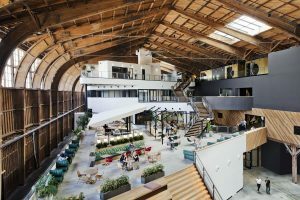 By 2022, four of the largest and most innovative companies in the world could be over one million square feet of LA-based, mixed-use office space. Here’s the breakdown of what they have planned for the near future. In just two years, Google has flipped the Spruce Goose Hangers into a massive four-story facility. Westside Pavillion, West Los Angeles, 585,000 sq. ft.
Expected footprint: 1,000,000+ sq. ft. In 2018, Google moved into the massive 525,000 sq. ft Spruce Goose Airplane Hanger in Playa Vista which looks radically transformed in the two years since their lease agreement began. By 2022, they’ll be taking over the intriguing nearly 600,000 sq. ft. space in the Westwood/Pico Area. The former home of the Westside Pavillion shopping center stretches nearly a half of a mile, includes glass ceilings and walkway over Westwood Blvd. 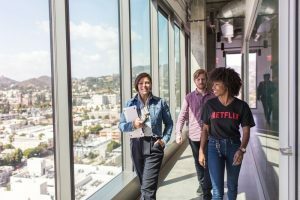 Inside Netflix’s 14-story location, ICON Building at 5800 Sunset Blvd, owned by Hudson Pacific Properties. ICON, Hollywood 325,000 sq. ft. CUE, Hollywood, 92,000 sq. ft. The Academy on Vine, Hollywood, 335,000 sq. ft.
EPIC, Hollywood, 325,000 sq. ft.
After their initial 4,000 sq. ft. Beverly Hills location in 2003, Netflix quickly grew their then satellite office to an 80,000 sq. ft. space before moving into their Hollywood locations in 2017. Their brand new developments, will both be overseen by Hudson Pacific Properties and will likely be completed in 2022. Beats Electronics, Culver City, 105,000 sq. ft.
8777 Washington, Culver City, 128,000 sq. ft.
Expected footprint: 200,000+ sq. 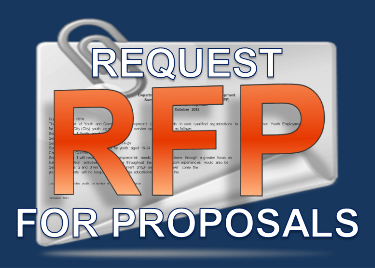 ft.
Apple announced in December 2018 that they would be adding 1,000 employees in a new development in Culver City. 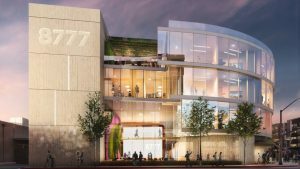 Both Apple’s new office space, and the adjacent $300-million Ivy Station development are set to open in 2019. The Water Garden, Santa Monica, 100,000+ sq. ft.
Culver Studios, Culver City, 500,000+ sq. ft.
Culver Steps, Culver City, 95,000 sq. ft.
Expected footprint: Approaching 1,000,000+ sq. ft. Since moving into the Water Garden in 2013, Amazon has quickly outgrown their Santa Monica home. 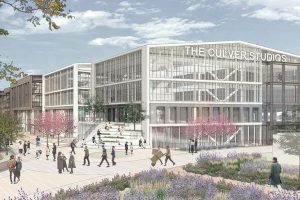 Moving forward they will inhabit the historic Culver Studios, among other Culver City locations, to drastically increase their mixed-used studio and office space for Amazon Studios, IMDB and other ventures. Expected to take over 70% of the 700,000+ sq. ft. revitalization of the nearly 100-year old Culver Studios lot, Amazon will also be taking over space in the brand new Culver Steps development, set to open sometime this year. Despite selecting Virginia and New York as the locations for their new “HQ2”, the impact of LA’s campaign for this space has clearly inspired new regional development by the largest and most innovative companies in the world. Not to mention, Amazon is already set to surpass 1,000,000 sq. ft of Los Angeles based real estate within the next three years. In addition to the good publicity produced by LA’s HQ2 campaign, what are some of the other reasons companies have gravitated toward LA? A solid ecosystem centered on innovation spearheaded by Mayor Garcetti, a desire to tap the wealth of talent in Los Angeles (especially in the content creation industry), and uber-efficient organizations like Gensler, CBRE and Hudson Pacific Properties all play a role in making Los Angeles one of the most desirable places for growing companies to expand their business. Join us at our 2019 Economic Forecast for more insight on the future local and national economy, click here for more info.